The Best Resource for Used Cloth Diapers Online! Cloth Diapering is a great way to save money on diapers for your baby, and used cloth diapers is an even better way to save, right? However, that initial investment on new cloth diapers can be very steep, which is why many moms turn to buying used cloth diapers. It’s a great way to save even more money. There are various sites that focus entirely on selling cheap cloth diapers that are gently used and you can take full advantage of their services. These sites are often closely monitored by administrators who ensure that everything stays legit, and that no one is cheated. It’s almost like going to a real “mom to mom diapers” event, but online. The cloth diaper trader you will typically find on these sites are moms like you, whose children have outgrown their cloth diapers. 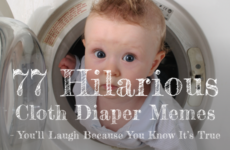 Many of the sites below are Facebook pages that are managed by cloth diaper brands. If you prefer certain brands and only want their products, you would be well advised to check out their facebook pages. If you really cannot be bothered and you just want cheap cloth diapers, then check out all the resources. Many of the sites are also great communities where moms not only buy/ sell and trade, but also talk and share with each other. Here is a list of 29 Cloth Diaper Traders where you can find Gently Used Cloth Diapers, at significantly reduced rates. The Cloth diaper trader is a classified website where people around the globe, sell their used cloth diapers. These used cloth diapers were once used by their children and now can be beneficial to you. There are great deals and you can easily pick up cheap cloth diapers, including pocket diapers and all in one diapers. You can only buy used cloth diapers from the advertisers in Cloth diaper trader. In Diaper Swappers, you can sell and buy used cloth diapers. Diaper Swappers is a forum where parents discuss their interest about motherhood and cloth diapering. Every member of this forum can become a cloth diaper trader and also recommend cheap cloth diapers. Diaper Swappers are popular with families because many of them are looking for a place where there is a cloth diaper sale. You can also find much useful information and advice in raising your children. This is a great social media community portal to buy and sell your used cloth diapers. There are many options to choose from so you can choose exactly what type of cloth diapers you need. B/S/T stands for “buy/ sell/ trade”. With over four thousand members, this group page is very active in monitoring their members. You can buy, sell or trade cloth diapers. Used cloth diapers are the main product of this group. To preserve the quality and reliability of each diaper trader, every member and postings is strictly monitored. Their rules and regulations create harmonious transactions between traders and members. Used cloth diapers are still highly useful and if you are looking for a trusted diaper trader feel free to visit this page. As the name implies, used cloth diapers are the main product of this group page. Many mothers from various regions and cities share and sell their used cloth diaper. It is a friendly online community that gives you an opportunity to learn more about cloth diapering and get to know about different types of cloth diapers. Before you can post or become a diaper trader, someone who is a already a member should recommend or vouch for you. This is how they maintain trust and reliability in the group. Used cloth diapers are available in fabulous and stunning designs – and this is a great place to go look for it. In this group page you will have the chance to swap your used cloth diapers and explore various options. Aside from cloth diapers this page also promotes other baby items. This page is also strictly monitored so that members and guests can be assured of quality and authenticity. Consisting of diverse members from USA/CANADA, this page has been very active in assisting members in selling and swapping their used cloth diapers. Since cloth diapers like pocket diapers are highly reusable, you can usually sell them and earn some extra money once your baby outgrows them. To be able to sell your used cloth diapers, or to buy, you must abide by the group’s rules and regulation. In order to have a bigger saving, many are now searching for gently used cloth diapers. In this group page, parents with interest in BumGenius cloth diapers, can sell and trade their BubGenious used cloth diapers. Through this page, you can swap and sell your used cloth diapers too. Like many other businesses, there is always risk in transacting online that is why you must take serious considerations the rules and regulation in cloth diaper resale. BumGenius is a popular brand of cloth diapers and this is the place to buy used cloth diapers from this brand. On this Facebook page, a cloth diaper trader has the freedom to introduce their brand new or gently used cloth diapers. Flip is another popular cloth diaper brand and in this Facebook group to buying and selling. If you are interested in selling your cloth diapers, make sure that it is almost as good as new for this group. With the various types of cloth diapers, quality is always a priority. This is another brand page on Facebook. Thirsties are one of the leading cloth diaper brands and this group page was created to connect mothers who share the same interest. In here, every member can become a cloth diaper trader and sell used cloth diapers especially cloth diapers from Thirsties. Every trader is screened to avoid scammers and to ensure that you buy high quality products. This is the Grovia brand’s buy/ sell/ trade page. On this page, every member is screened to avoid nuisance and scammers. This group is very active with over eighteen thousand members. Softbums is another cloth diapering brand. This brand is known for its high quality cloth diapers, so even a used cloth diaper of this brand is still in demand. This group is encourages you to be vigilant in every transaction. The Sustainablebabyish brand is a common one. In this group, every member is validated for legitimacy to assure buyers of quality when buying gently used cloth diapers. Sloomb is one of the trusted cloth diaper providers. If you want to participate in cloth diaper resale, contact support at hey@sloomb.com. Aside from gently used cloth diapers, Sloomb also has various products that can suit your children’s interest. Celebrating its fifteen years in cloth diapering, Kelly’s closet never fails to provide their avid customers with high quality cloth diapers. Among the amazing options at Kelly’s Closet, you will have the independence to choose among the used cloth diapers and other baby products. To provide you a quality assurance, Kelly’s closet offers 30-day trial program to their gently used cloth diapers. Cloth Diaper Outlet is another amazing one stop shop that provides you an option to buy and sell your used cloth diapers that are in good condition. Gently used Cotton Babies cloth diapers may be traded in, for credit. However, not all Cotton Babies products, but only the items that they currently sell on their site, will be accepted in their “Growing up in Cloth” program. Also, if you originally purchased a used item, you will not be able to resell it for credit on their site. Modern Cloth is another amazing one stop shop for your baby needs. One of the best sellers of this online shop is their gently used cloth diapers. You have four categories to choose from, used cloth diapers in excellent condition, good condition, well-loved and needs repair. Because of this categorization you will be well-informed about the actual condition of the used cloth diapers. Aside from cloth diaper resale, you can also explore the site for other amazing baby products. Nicki’s Diapers offer their customers a 15- day wash program. This serves as a trial period for customers who buys NEW cloth diapers on their site. This program offers a try, wash and return option, so customers can buy cloth diaper and return it if they don’t like it. It is then these returned items, that are then solds as “gently used”. You might be surprised by the large selection of new and used cloth diapers at diaper junction. Diaper Junction is one of them most visited one stop shops for cloth diapering needs. Jillian’s Drawers has a large variety of new and used cloth diapers for your baby. Over the moon diapers is a child friendly one stop shop that offers wide variety of brand new and used cloth diapers. Aside from their online shop, over the moon also offers advice and techniques about effective cloth diapering. Mercari is sells toys, accessories and cloth diapers. You can choose among the wide selection of high quality pocket diapers and gently used cloth diapers at Mercari. They are an online consignment shop that sells new and gently used cloth diapers and accessories. If you are local to Atlanta, they also offer workshops. This is a good place to shop and learn and connect with other moms who share your interests. AliExpress sells NEW cloth diapers BUT they can be very cheap – as cheap as gently used diapers. The quality can be iffy but if you take the time to research, you may be able to find good quality cloth diapers and low prices. Chuddy buddy cloth diapers a popular cloth diaper supplier. They sell new and gently used cloth diapers. From the name itself, the cloth diaper outlet is a one stop shop where you can find everything you will need in cloth diapering. In here you can also buy brand new and pre-loved items like gently used cloth diapers. They have a wide selection to choose from. You can sign up for their newsletter, and be notified of upcoming cloth diaper sales. Lil Bums one size cloth diapers are considered to be one of the softest cloth diapers on the market. Because of its quality, they have a high resale value. Compared to other online shops, Cloth for a Cause is prioritizing families who are in need of assistance. This group is providing used cloth diapers to families who can’t afford brand new. Members and guests donate their used cloth diapers to be given to other families in need. Cloth for a cause is also building a helpful community where parents are helping each other. If you’d rather donate then sell, this is a great opportunity to help others. If you are on the other side and need help, this might be a good place for you to find that help. 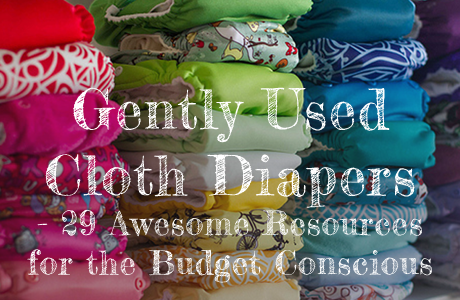 Using cloth diapers instead of disposable diapers, is definitely the budget friendly thing to do. However, buying used cloth diapers will definitely reduce an already limited budget. 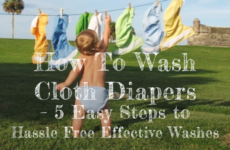 This is a great resource to help you find groups and websites that offer gently used cloth diapers.